Vendor Order Form Use this form to get a quote for Custom Shade Sails. Monotec - Strongest in the industry. Monotec - Fire Rated - Strongest in the industry with NFPA and CA FM fire ratings - cost 15% more. Shadetex - Less expensive with additional color choices (inappropriate for sails with perimeters greater than 80' around). Please select a type of fabric. Sails with more than 4 corners require manual order form. Please Be Advised... Perimeters exceeding 960" on this form are considered Over-sized. Over-sized sails are not warrantied unless the installation is designed, engineered and installed by us. 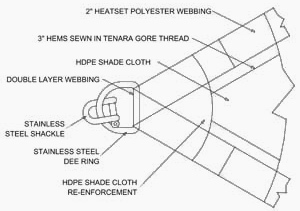 Though we have made hundreds this size they need to be properly installed onto a properly engineered structure to assure they have a long life span.. the sail would still be warrantied against flaws of workmanship and materials but we can not warrant any specific life span on a sail this large where we do not control the whole process. Most customers prefer to provide us with measurements of the space to be filled and have us calculate the final dimensions of the sail. With this option, we will adjust the sail dimensions to allow for needed hardware and will ship the hardware along with the sail as part of the price. 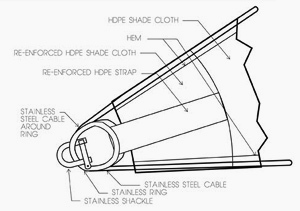 Sails ordered using this option are warrantied to fit if measured according to the instructions provided on this website. Pick this option if you prefer to have us make the sail to the measurements you provide. With this option, we will fabricate to the exact dimensions you specify. Hardware is not included in the pricing and must be ordered separately. Sail is warrantied to match the measurements you have provided, but we can make no warranty as to whether it will fit your space. Please purchase fixing/tensioning hardware separately from our hardware page. Sail is not warrantied to fit your space. It will be made the dimension you provide. Please select the number of corners first. Enter in the height measurements of the fixing points heights above grade (above the ground). Estimates can be made to the nearest half foot. Did you buy your eyes from us? Select an Option... Yes No Note: To be eligible to receive our warranty, it is required that our hardware be used exclusively.